How Does the Helios System Work? 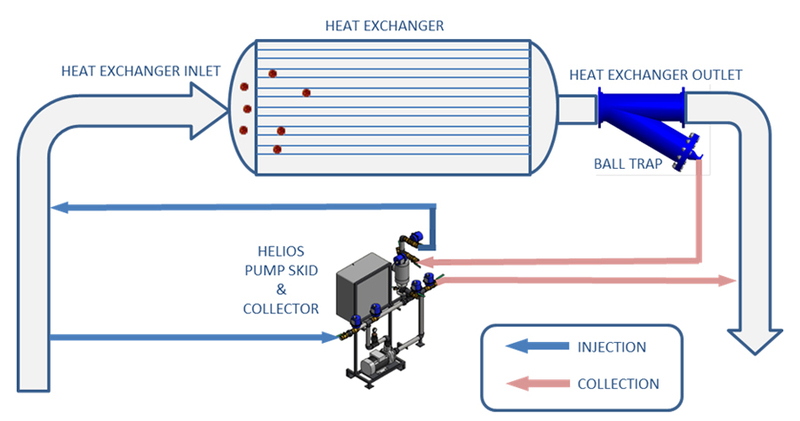 The Helios Automatic Tube Cleaning System continuously cleans heat exchangers by circulating sponge balls through the heat exchanger tubes at programmed intervals, preventing residue, deposits, and bio-film from accumulating in the tubes. The sponge balls are slightly larger in diameter than the tubes, and wipe the tubes clean as they pass through. The balls are then trapped on the outlet side of the heat exchanger where they are collected, transported, and stored until the next cleaning cycle begins. Between cycles, the sponge balls are stored in the Collector and all valves are closed. At programmed intervals, the Controller commands the injection valves to open and pump to start, and the balls are injected into the heat exchanger inlet line. Normal cooling water flow transports the balls through the heat exchanger tubes and into the Ball Trap. The Controller then prompts the collection valves to open and pump to start, and the balls are returned to the Collector, where they are held until the next injection/collection cycle starts.